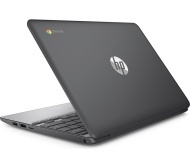 alaTest has collected and analyzed 14 reviews of HP 11-v051na 11.6" Chromebook - Grey. The average rating for this product is 3.7/5, compared to an average rating of 4.1/5 for other products in the same category for all reviews. People really like the battery and size. The usability and performance also get good views, whereas many are critical about the price and reliability. We analyzed user and expert ratings, product age and more factors. Compared to other products in the same category the HP 11-v051na 11.6" Chromebook - Grey is awarded an overall alaScore™ of 87/100 = Very good quality. Just like how light the product is. Great battery life and portability. Illuminated keyboard would be welcomed. Returned 2 chrome books in two days because of login issues, screen would go black and wouldn't log in. It's a nice idea but it has to work.